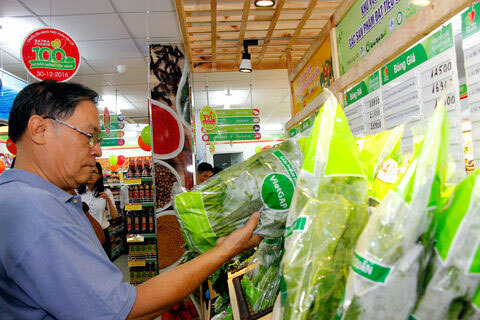 The Saigon Trading Corporation (Satra) launched two convenience stores (Satrafoods) in the Mekong delta city of Can Tho on January 18 with a view of helping local customers to shop safe food. The new shops have brought Satra’s Satrafoods stores to 102 nationwide and the corporation plans to open eight more Satrafoods stores in Can Tho alone this year and set up the model in Ben Tre province. Satrafoods sells around 2,500 food items, with VietGAP – labeled vegetables and fruits accounting for 70-80 percent. It also sells fruits imported from the Netherlands, France, the Republic of Korea, the US, and New Zealand. At the inaugural ceremony, Tran Van Bac, Satra’s Deputy Director General, unveiled a plan to expand the corporation’s retail shops to 172, including 155 Satrafoods stores, two restaurants, and one Satra Bakery & Café. The corporation is going to build two trade centres in Cu Chi district and district 6, in Ho Chi Minh City, Bac said. Established in 1995, the State-owned corporation made revenues of nearly 55.3 trillion VND and a profit of nearly 11.1 trillion VND in 2016, expanding 12 percent and 26 percent from 2015. It has a staff of nearly 10,000 employees. Can Tho currently houses 18 marts and trade centres and over 100 wet markets and convenience stores. The city recorded a total goods retail value of 95.6 trillion VND in 2016, leading other localities in the Mekong delta and ranking third nationwide after Ho Chi Minh City and Hanoi./.